I've been thinking on Bastion and Dominion's general rules regarding mats. I'm of the opinion that cards on mats are not automatically returned to the player's deck for counting points. Mostly this doesn't matter with the official cards, but with Bastion it would. If the Estates are not specifically told to return to the deck at the end of the game, they won't be counted. This is a small difference in score, but I'm curious what your intention was? To have the Estates count towards your score or not? What LFN said, Inherited Estates as Ratcatchers for example, still give 1VP if they're in the tavern. Also I'll take the opportunity to mention that work is being done on the set, just a little slowly because I've been busier than I anticipated recently. I've been thinking of gutting the Coffers from the set because I think I overstuffed it with different mechanics a bit and then Renaissance was announced so that kind of settled that. Expect a big update at some point with all the Coffers replaced with new Reserve/Ice token designs. I'm of the opinion that cards on mats are not automatically returned to the player's deck for counting points. matters for points. Just put everything, i.e. hand, deck, discard pile and cards on mats (except for Distant Lands but this is obvious as it explicitly cares about where it is) together and then count points. So if those Misers put 6 Coppers on your Tavern mat and those 4 slumbering Wine Merchants are still in the Tavern your Gardens are worth 1VP more. Reclaim - This looks fairly strong to me, if you can trash from discard. Compared to Remodel, Reclaim keeps one extra card in hand. In the late game, that extra card is often Gold. So you can imagine playing Reclaim, playing Gold to buy something, and then calling Reclaim next turn to trash the same Gold for Province. Of course, often your discard is empty at the beginning of your turn, especially in engines, in which case Reclaim is a gimped Remodel. So it's better than Remodel in good stuff strategies, but still works in engines. I like it. Bastion / Isle - I think the Duke comparison is apt, but Bastion is less interactive than Duke because $2 and $4 are fairly low price points that don't require you to build a good deck. And because they're terminal stop cards, it's actively difficult to build an interesting deck that synergizes with them. As for Isle, the higher price point is more interactive, but I think it's just too weak. I don't like the setup rule because Isle+4 coppers is really sad. Although Violet CLM's night card idea seems overly complicated to me, in a way I think it makes a lot of sense. Hitting a high price point with an estate in hand is a more interesting hoop to make players jump through. Outcast - This just seems very low impact, to the point of being uninteresting. It's like caravan guard--a bland card IMO--but blander. Or like Encampment but without the gold/plunder reveal option. Supply Post - I think this is really neat. It's a bit like Embargo in how it impacts asymmetric strategies, but it uses a carrot instead of a stick. I really like Embargo and am constantly disappointed by the fact that Embargo simply isn't that good, but I think Supply Post is a lot better because coin tokens are pretty much always decent. I wouldn't worry at all about the trade route interaction. It doesn't actually seem to be imbalanced or lead to any contradiction, it's just a weird interaction kind of like the Defiled Shrine / gathering pile interactions. Summoner - I would compare this first to Cobbler, which is also basically a cantrip gainer. Cobbler is faster though, and you don't have to decide what you want before you get it. From Summoner, I'd expect some hilarious antics as I choose cards that it later turns out I didn't really want. But now I'm thinking, does this card actually work? The main usage seems to be winning important splits from piles you don't actually need right away--say, Advisor or Herald. Or gaining Silk Roads, which looks pretty degenerate. And once you gain all the things you wanted, you might gain estates and hope the game ends before the ice runs out. Pioneer - It's sounds fine. In general I would choose copper in hand over +$1, if only because that removes copper from the shuffle. It's also better with discard for benefit--say, Warehouse. But the benefit compared to peddler seems marginal most of the time. Okay, I am convinced. This was the evidence I was looking for, because the rules really tell a different story in terms of how Mats work at the end of the game. Thanks to you, LastFootnote, and Holunder9 for the clarification. 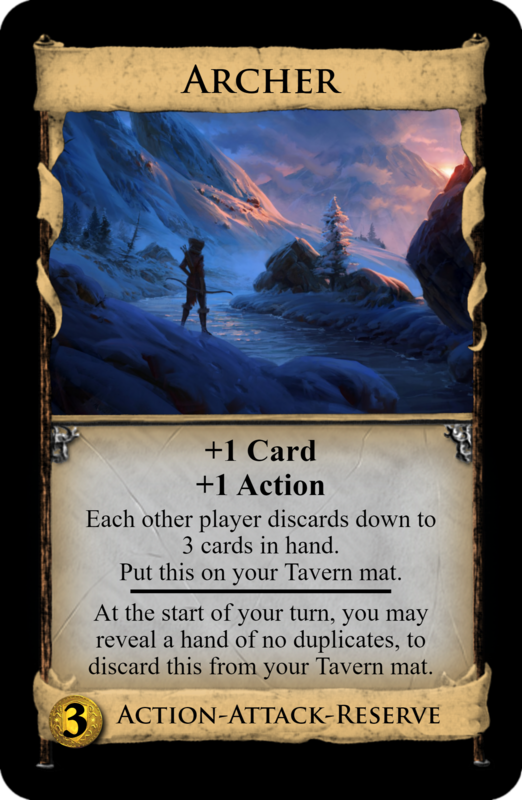 Possibly even more notable in terms of how it works - a Distant Lands on your tavern mat is worth 4 VP, but also counts as a card in deck when you count up for Gardens. 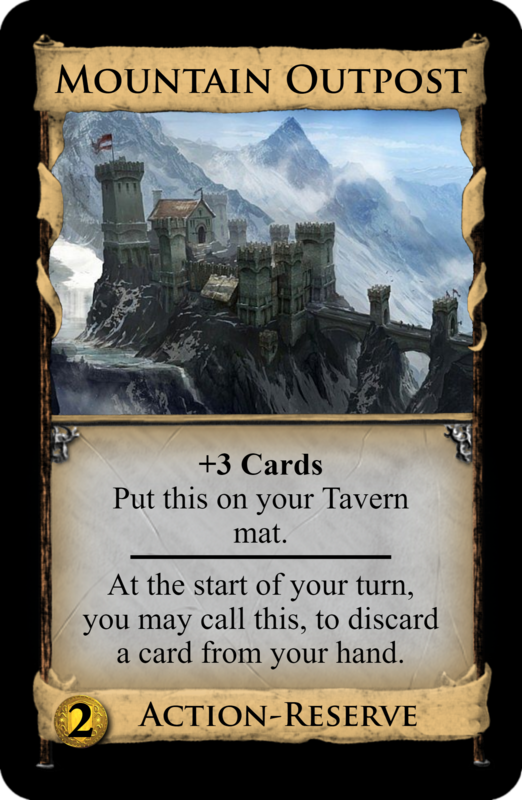 Bastion - Since we've concluded cards on mats are "taken" at the end of the game, Bastion should say "Worth 1VP per Estate on your Tavern mat at the end of the game." Otherwise, technically no Estates will be on your mat when Bastion is scored. Thumbs up for Igloo being very similar to Cargo Ship! I've done a pretty big post-Renaissance update to the OP. Coffers have been made redundant and so are cut, some other cuts and tweaks some new cards, trying new frozen wording. Hunter changed "Game" to "Prey"
Here's a bonus card which I wasn't confident enough in to put it directly into the OP, does anyone actually understand what this card does? You'll need a magnifying glass first! 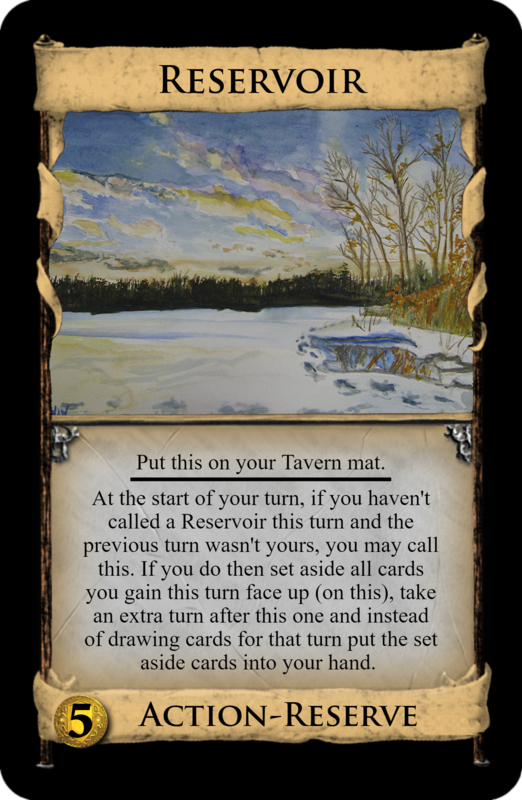 Just to be clear; you may call one Resevoir per turn, and on that turn, you set aside all cards you gain, and at the end of your turn, you take an extra turn in which your hand is made up of the set aside cards. Mountain Outpost looks crazy strong. The drawback looks pretty small. Maybe it should discard two cards? Sanctum looks strong and not very interesting. I like Periapt. Buying a curse to gain a few $5 cost cards is neat. 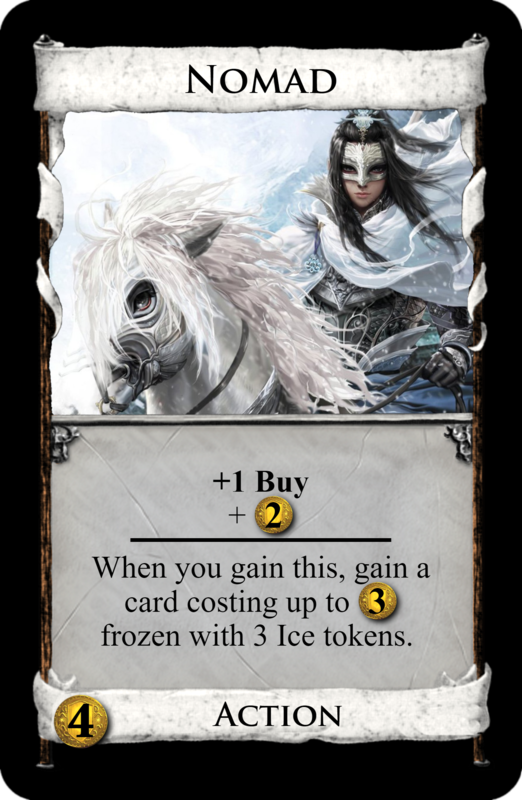 I like the new Glacier card with +1 card instead of coffers. I never liked the idea of a village that you couldn't use for several turns after you buy it. Doesn't seem fun. That said, I like Lake Village better than Mountain Village. Congrats on designing Cargo Ship before Donald did. I disagree with LibraryAdventurer about Sanctum. While it could trash more cards than Chapel we know from Ratcatcher how much being a Reserve hurts trashers. Although Sanctum being able to trash during or at the end of the turn is a significant advantage over Ratcatcher. I like it. Periapt is basically better than Cursed Gold so as long as there are trashers in the Kingdom it seems like a no-brainer to use a Buy for a Curse and a $5. Scrounger is by far my favourite. It looks so simple, being to Smithy what Mountain Village is to Village, but coming up with the simple stuff is often the hardest thing to do! Agreed that Nomad is kinda weak. Actually having reserves in the set kind of makes the "freeze from play" thing a bit less novel because all reserves remove themselves from your deck when you play them... I have this other thing, a Woodcutter that comes with a free frozen card. I have done some solo testing games with Sanctum and it seemed pretty cumbersome and difficult to get much out of early but if you could set up some draw you can get some big trashes off, sort of like Cemetery or Mint, but you have to draw and play this do-nothing terminal first. So it can do powerful things, but you need to play around it and set it up, which I think is what you want dominion cards to be doing really. I was thinking of trying Mountain Outpost a a $2 cost Smithy. The problem with the big version is that it isn't great at being deck-drawing engine draw because you can only call 2-3 per turn and also can only play them every other turn, but it's kind of ridiculous as big money draw. Cantrip-Militia but it isn't too easy to get back, I like that opponent's Archers as well as Reserves like Mountain Outpost or Spelunkers make this easier to discard from the mat. Nomad - This would be interesting if you had a choice of how many times you could freeze the $3 cost card. Like a range from 3 to X times. Would open up some cool strategies with freezing Estates. You could also use it with fast trashers like Chapel to get a Silver into your deck at that crucial point when most of your Copper economy is gone. Sounds small, but it could mean the difference of one turn over your opponent. Either way, it's always nice to see some Woodcutter variants!